16-year-old Need-Knower, Ross, has Spinal Muscular Atrophy (SMA), a progressive neuromuscular disorder which impacts his ability to walk long distances, climb stairs and to get in and out of cars easily. He has has difficulty standing from a seated position, and leaning on a surface to pull himself up is often not sufficient. This impacts his independence at school when class finishes. Team ‘Take a Seat’ created two prototypes to assist Ross with rising from a chair: the first solution is a portable iPad docking station which doubles as a discreet lift-off platform to rise from a seated position. The second is a compact floor base which accepts and locks in a cane to provide multi-angle lift-off support to assist him rising from a chair. Most weight machines are designed for able-bodied users. Nij is a 27-year-old need-knower with hypoxic-ischemic encephalopathy which means his entire right side is significantly weakened. This makes weight lifting machines difficult to use with his full body. He also does not have full extension and cannot adequately form a tight grip. The challenge was to create an adaptive device for weight machines and gym equipment. Team ‘Bioj4ck’ created a dynamic elbow extension wearable from the bicep to the hand, enhancing muscle activity and improving Nij’s range of motion by providing support for full arm extension. The team also designed a glove which strengthens his wrist and stabilizes his grip when using dumbbells and bars. Ursula is a 9-year-old need-knower with Hypotonic Cerebral Palsy and has difficulty feeding herself due to motor planning difficulties and ongoing oral-motor issues: she is unable to open her mouth wide due to inflexibility of the jaw hinge and to move her tongue bilaterally. The team developed cutlery prototypes with a customizable grip for firmer control at the base and provided Ursula the ability to modify the position of the cutlery ends so that she can choose an optimized angle when feeding herself. The team also created a discreet design for the cutlery which mimics the look of a magic wand. Electric wheelchairs on the market are heavy and extremely expensive. Six-year-old Ryan, who has has cerebral palsy and limited mobility, needed an adaptable stroller which could be electric, lightweight, and easy for transport. The team created a “fun mobility chair” which is affordable, lightweight, easily transportable and electrically-operated. The team motorized a stroller by hacking a hoverboard which Ryan controls through a joystick, offering him greater independence and easier access in public settings. Seniors like Roberta who use walkers in multi-flight apartment buildings struggle to climb stairs. The challenge was to develop a lightweight modification to a walker which would allow ascension with ease. The team modified Roberta’s walker by adding a small tri-wheel system to the existing model, allowing her to easily ascend the stairs in her fourth-floor walkup apartment. Additionally, the team created a telescopic door stopper to hold the door open for her. The device is lightweight and compact enough to store in a bag on her walker. Roberta no longer faces a challenge in reaching her apartment. The switch toys on the market today are limited in variety, generally are expensive, and are often not durable. Many are not sufficiently stimulating for special needs children who crave a normalized environment that will allow them to use the same popular toys that other children have. The challenge was to create a wireless interface between a child’s switch and a toy. While there are toy adapters on the market, they come with hanging wires which are dangerous for children and can break easily. The device would also need to be easy for any able-bodied users to insert into the battery pack. The need-knower from the Blythedale Children’s Hospital staff worked with her team to create a wireless, two-button device which activates a toy’s on-off functions, and can also activate an additional device which triggers the various features of a toy. Children with disabilities often have fingers with atypical posturing--a child’s finger joints may appear to bend backward. When fingers are held in better alignment, children have better use of their hands. Ring splints, which are small, plastic orthotics that hold fingers to improve alignment, are commercially available, though stock sizes often do not fit children appropriately or require multiple fittings. Stronger, custom silver splints are also overly expensive. The challenge was to develop a platform to design and produce affordable ring splints in custom sizes, colors and shapes. Team Ring Bling worked with their need-knowers--a team of specialists from Blythedale Children’s Hospital--to create a digital platform allowing physical therapists to customize and 3D print ring splints within a hospital setting. After inputting a patient’s measurements into the newly created RingBling.org, the therapist can then take the file with the specifications and 3D print customized ring splints with a range of materials, colors and designs. Visit http://ringbling.org/ for a full tour of the customization process. Many children with disabilities do not have the motor control to independently sit upright. When provided a chair with sufficient support, they are able to use their eyes and hands for learning and play. Physical therapists from Blythedale Children’s Hospital challenged their team to create a customizable pre-school chair which would provide optimal postural support. The team created a lightweight and mobile pre-school chair which provides postural support for a disabled child’s trunk, hips and head and which also has the ability to tilt in space for times when a child needs to lean back. This solution allows young children to better engage at play, in school, and in everyday life. 11-year-old need-knower Ali has a tendency to thrust her head backwards when walking, which causes both Ali and her caregiver behind her to lose balance. She also has the tendency to make erratic movements causing her to release, for example, a cup if it is in her hand. The challenge was to create both a head support unit to prevent Ali from thrusting her head backwards and to design a device to secure a cup. Team ‘Ali’s Angels’ created a lightweight, wearable support system for walking which provides padding to prevent backward head thrusting. The team also designed a cup-holding glove securing Ali’s hand using a thick, comfortable, elastic band. Team ‘Ali’s Angels’ designed creative, low tech solutions and produced significant and effective results for the young need-knower. Wheelchairs rarely come with accessible bags and those that do are often fitted on the back where they can't be easily reached or will require assistance for access. The challenge was to create a deployable bag system which would provide easy and independent access for Anthony who is a need-knower. The team created a foldable platform designed to provide Anthony with independent access to his tech, medications, and more. The assistive device is stowed on the side of Anthony’s chair and can be accessed manually to provide him a steady, tray-like surface. This devices also provides a place to write or use an iPad, and its under side contains pouches for storage. The team hacked a smartwatch to provide essential sensing components for need-knower, Ben. The smartwatch can detect signs of distress such as increased heart rate, irregular movements and muscle contractions. It then audibly communicates with Ben, asking basic questions around his emotional and physical status. Ben has the option to indicate his emotional level by swiping left or right. If he requires assistance or does not respond within 30 seconds, an alert will emit from the watch notifying an accompanying aid of his status and will simultaneously initiate an app designed to calm him down. Dwight is quadriplegic maker and need-knower who teamed up with local makers to design a single-button remote. The challenge was to to create a solution for a standard remote where buttons were too close together and changing channels was difficult without pressing more than one button. The team created a voice-activated remote which allows users like Dwight with limited mobility to cycle through TV and light functions. The remote also provides a large, accessible, single selection button large enough to accommodate limited hand mobility. The team’s device provides Dwight greater independence and the prototype has the potential to control additional home devices. Jojo is a 4-year-old need-knower with Arthrogryposis Multiplex Congenita--he has curved joints and a minimal amount of muscle which makes many of the activities of daily living very difficult. The challenge was to create a device which would enable Jojo to dress himself independently. 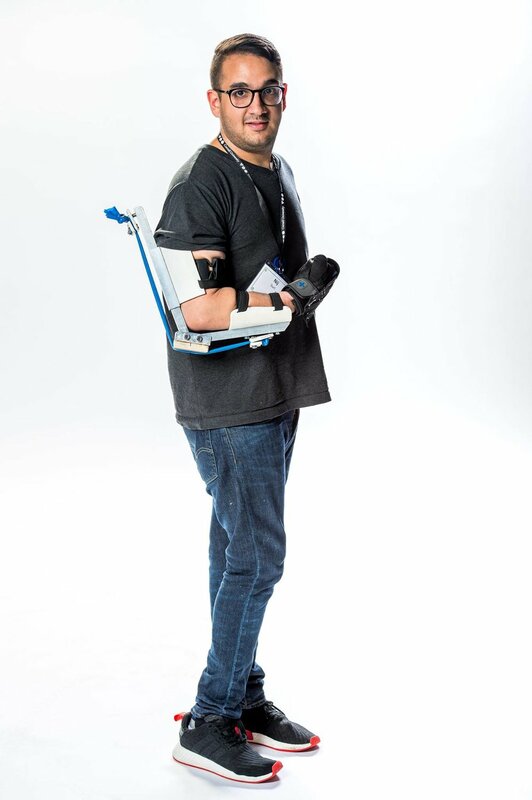 The team built Jojo a mechanically operated dressing assistant that can be attached to any chair. It features a motorized arm which holds Jojo’s shirt open and in place so that he can insert his arms, which are then mechanically raised into a position which completes the dressing process. The device can also be modified to adapt to Jojo as he grows bigger. Rachel is a need-knower who uses a scooter for mobility in Manhattan. The challenge she presented her to team was to create a portable, light-weight ramp to achieve greater accessibility in urban environments. The team created a lightweight, foldable ramp system durable for scooter use in cities, and compact enough to travel like a purse between Rachel’s legs. The ramp weighs under 10lbs and can be used to climb curbs and stores with front step access. In providing a need-knower like Rachel greater mobility in Manhattan, individuals with similar challenges now have access to Rachel’s prototype and can navigate various areas overlooked by city planners. 19-year-old Renee ambulates with two canes with rubber tips and which are extremely slippery on wet surfaces--from rain and snow to marble surfaces and mopped floors. Additionally, when she is seated in public, her canes need to be put aside, and storing canes upright isn’t easy as they they often fall. The challenge was to develop anti-slip cane tips and a lightweight hanger for use in public settings. Team ‘Yes We Cane’ created anti-slip cane tips with two design solutions: the first was a 3D printed tip which mimics tire designs and the second is modified from a bicycle tire which attaches onto the cane tip for stability on slippery surfaces. The team addressed the second element of the challenge by developing an affordable 3D printed cane add-on which uses a clip function to latch onto objects like a chair in a restaurant.